Much like the most famous football or cricket grounds around the world greatness is bestowed on particular golf courses because of the history that comes from hosting prestigious events. Individual countries may boast many fantastic venues, but nothing beats visiting the scene of some of the sport’s greatest moments. So for the budding golf historian eager to steep themselves in the traditions of the game, the venues for the four majors – the big championships – are the obvious places to start. The United States is the home of three of them: the PGA Championship, the US Open and the Masters, while the United Kingdom hosts the Open Championship. In terms of team competition, the two biggies are the Ryder Cup for men, which alternates between US and European venues on a two-year frequency, and for women the Solheim Cup, again a biennial event. Let’s start with the Open Championship, simply because its rota of venues includes the undisputed home of the game, St Andrews (www.standrews.org.uk). The Open returns to this corner of Scotland in 2010, when it will celebrate its 150th anniversary. In the meantime, the venue’s website includes a wealth of information on course information, green fees, and club hire. Carnoustie, Royal Troon and Muirfield are three other Open courses in Scotland while south of the border, the 2008 host Royal Birkdale (www.royalbirkdale.com), near Southport, and Royal St George’s (www.royalstgeorges.com) at Sandwich in Kent are two of the English venues. A full list of the Open courses can be found on the competition site (www.opengolf.com). Angel Cabrera was the winner of the 2007 US Open, held at the Oakmont Country Club in Pennsylvania (www.oakmont-countryclub.org). The course has hosted more major championships than any other course in the US and boasts 150 deep bunkers that await the wayward golfer. Next year, the tournament will be held at Torrey Pines in San Diego, California (www.torreypinesgolfcourse.com), followed 12 months later by Bethpage State Park, Farmingdale, New York. Further information on the tournaments together with ticket information can found at the site of the United States Golf Association (www.usga.org). The 89th PGA Championships was held this year at Southern Hills Country Club, Tulsa, Oklahoma (www.southernhillscc.com) and was won by an all too familiar face, Tiger Woods. Next year, Oakland Hills Country Club, Bloomfield Township, Michigan (www.oaklandhillscc.com) will be the venue, while in 2009 it will be Hazeltine National Golf Club (www.hngc.com) in Minnesota. More information is provided by the Professional Golfers’ Association of America at www.pga.com. Unlike the other majors, the Masters has just one home, Augusta National in Georgia (www.augusta.com). Zach Johnson from Iowa proved this year that winning majors doesn’t have to be the sole preserve of the big boys. Next year’s Ryder Cup will played at the Valhalla Golf Club, Louisville, Kentucky (valhallagolfclub.com). For ticket information, visit (www.rydercup.com). The site also lists previous venues, which include most recently The K Club (www.kclub.com), in County Kildare, Ireland and the aforementioned Oakland Hills in Michigan. With apologies to American readers, if you want to visit the site of the US team’s victory, surprisingly, back in 1999, head for The Country Club in Brookline, Massachusetts (at the moment, the club doesn’t have an official golf site). The Solheim Cup began in 1990, and among previous venues have been Loch Lomond Golf Club (www.lochlomond.com) in Scotland, in 2000, and two years ago, Crooked Stick Golf Club, Indiana (www.crookedstick.org). The US currently leads by six to three, so with this year’s match being held in Halmstad (www.ladieseuropeantour.com/solheimcup/solheim.php), the European ladies will be hoping for Swede dreams. 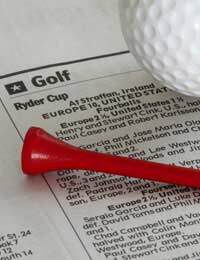 There are a number of operators who offer packages to the above venues, as well as the major championship events. Tickets for the majors are often distributed on a ballot system so it is always wise to consult the site of the relevant organising body as to both the procedure and when tickets go on sale.